April 23, 2013. The hospital calls Dr. Han because Sun-woo isn't showing up for treatment. He visits Sun-woo and finds him passed out on the couch and the house littered with liquor bottles. He tells Sun-woo to pull himself together and reveals that Min-young and her family have gone on vacation to Japan. Sun-woo sits exhausted outside the OR, and Dr. Han calls Min-young to tell her to return to Korea. Cops pull up in front of a gas station owned by Evil Minion and arrest him for stabbing Sun-woo on April 11. The surgeon had found his broken-off fingernail in the wound and since he had a criminal record his DNA was on file. The cops also discover that Dr. Choi had been wiring money to the Minion family. Evil Minion is flabbergasted to be accused of stabbing someone he didn't know, and also that the cops have his knife from 20 years ago. He calls Dr. Choi, who starts to think about that CCTV picture from 20 years ago. Thinking that man could really be Sun-woo makes him bug-eyed. Sun-woo tears out every page from his old diary that talks about time travel and flushes them. (Why were they at the hospital?) He tells Dr. Han that Choi will figure it out soon. He wants to get rid of the last incense stick. 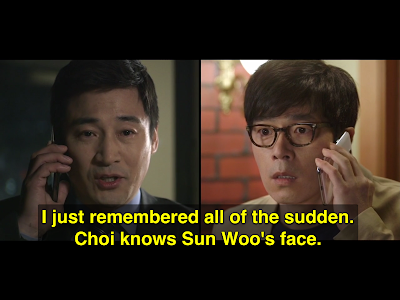 Meantime, Dr. Bug-eye remembers Sun-woo saying he would have to go and see who killed his father. He had asked how, and Sun-woo had said, “It's easier than you think.” [32:43] He finds out that hyung is in the ICU and goes to see him. Sun-woo is sitting outside with the suicide letter in which hyung writes that his biological father is Choi and he's nothing but a source of unhappiness to everyone. Choi comes back out and accuses hyung of being unstable and weak. He adds that 20 years ago a man was stabbed and disappeared, but is sitting in front of him right now. "Is it like a time machine?" he asks. Sun-woo answers, "yes." Choi leaves, and in a shiny silver car to match his shiny silver suit, instructs his aide to search through everything he can about Sun-woo and find out what he's been doing since December. Sun-woo remains outside the ICU staring at his last incense stick until Min-young walks up. They stare at each other, tears rolling down their faces. Is Dr. Choi worse now than in the original timeline? Originally he had manipulated hung and hired an arsonist. (Where do you get an arsonist from?) This time around they have a witness to deal with, and athough Choi didn't want any killing at first, the minion disagreed and now it doesn't seem to bother him. Apart from that, Choi still has the same crooked business deals going on.